IC Insights has updated the top 25 semiconductor companies which include merchant chip makers, foundries and fables companies. 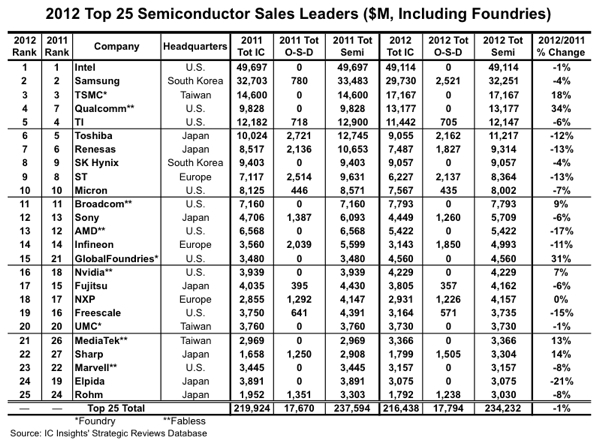 The top 25 worldwide semiconductor (ICs and O-S-Ds—optoelectronics, discretes, and sensors) sales leaders for 2012 include 10 suppliers headquartered in the U.S., seven in Japan, three in Taiwan, three in Europe, and two in South Korea, a relatively broad representation of geographic regions. The top 25 ranking also includes three pure-play foundries (TSMC, GlobalFoundries, and UMC) and six fabless companies. It is interesting to note that the top five semiconductor suppliers all have different business models. Intel being essentially a pure-play IDM, Samsung a vertically integrated IC supplier, TSMC a pure-play foundry, Qualcomm a fabless company, and TI a fab-lite semiconductor supplier. In 2012, the pure-play foundries and fabless companies were the star performers. 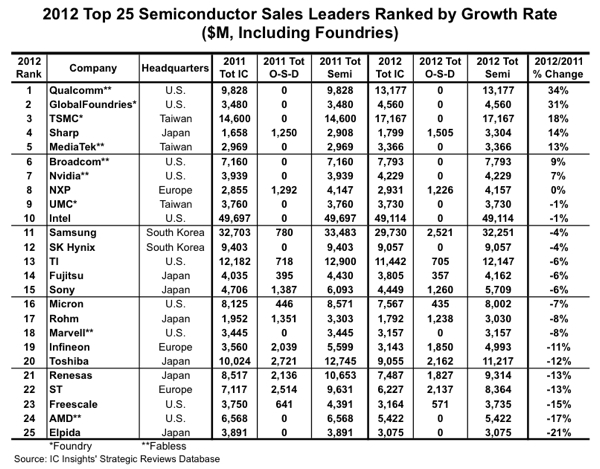 IC foundries are included in the top 25 semiconductor supplier ranking because IC Insights has always viewed the ranking as a top supplier list, not as a marketshare ranking, and realizes that in some cases semiconductor sales are double counted. With many of our clients being vendors to the semiconductor industry (supplying equipment, chemicals, gases, etc. ), excluding large IC manufacturers like the foundries would leave significant “holes” in the list of top semiconductor suppliers. Foundries and fabless companies are each clearly identified in Figure 1. In the April Update to The McClean Report, “marketshare” rankings of IC suppliers by product type are also presented and foundries are excluded from these rankings. Overall, the list shown in Figure 1 is provided as a guideline to identify which companies are the leading semiconductor suppliers, whether they are IDMs, fabless companies, or foundries. In total, the top 25 semiconductor companies’ sales declined by 1% in 2012, two points less than the total worldwide semiconductor market decline of 3%. It took semiconductor sales of at least $3 billion in 2012 to make the top 25 ranking, about the same dollar amount needed to construct a 10K wafer-per-month 300mm wafer fabrication facility. Intel remained firmly in control of the number one spot in the ranking in 2012. In fact, Intel, helped by its acquisition of Infineon’s wireless IC business, extended its lead over second-ranked Samsung by registering a 52% higher semiconductor sales level than Samsung in 2012 as compared to a 24% margin in 2010. The only movement with regard to the top five spots in the 2012 ranking was that fabless supplier Qualcomm registered a 34% surge in sales and moved up three positions to replace TI as the fourth-largest semiconductor supplier. After its 21% drop in sales in 2012, Elpida, which is due to be acquired by Micron sometime in the first half of 2013, fell five spots in the top 25 ranking going from 19th place in 2011 to 24th place in 2012. However if Micron and Elpida’s 2012 sales were combined, the “new” company would have had $11,077 million in total sales and would have been ranked as the seventh-largest semiconductor supplier, only $140 million behind sixth-ranked Toshiba. New entrants into the top 25 ranking in 2012 included Taiwan-based fabless communications chip specialist MediaTek, which moved from being ranked 26th in 2011 to 21st in 2012. MediaTek is Taiwan’s largest non-foundry semiconductor supplier. Japan-based Sharp jumped five positions in the ranking last year and moved into the 22nd spot. Sharp’s 14% total semiconductor sales increase in 2012 was spurred by a 20% surge in its O-S-D sales. As shown in Figure 2, there was a wide range of growth rates among the worldwide top 25 semiconductor suppliers last year. It is interesting to note that despite the close on-going relationship between GlobalFoundries (31% increase) and AMD (17% decline), the two companies were at opposite ends of the growth spectrum in 2012. Considering that AMD, the original “parent” and largest customer of GlobalFoundries, suffered such a steep sales decline last year, it is obvious that GlobalFoundries’ spike in revenue in 2012 was driven mostly by its success in attracting new IC foundry customers (e.g., ST, Freescale, Qualcomm, etc.). The continued success of the fabless/foundry business model is evident when examining the top 25 semiconductor suppliers ranked by growth rate. As shown, the top seven performers included four fabless companies (Qualcomm, MediaTek, Broadcom, and Nvidia) and two pure-play foundries (GlobalFoundries and TSMC). Illustrating the very difficult year faced by the majority of the top 25 semiconductor suppliers, 17 of the top 25 ranked companies registered a sales decline last year, including 8 of the top 10 largest semiconductor suppliers in the world (#1 Intel, #2 Samsung, #5 TI, #6 Toshiba, #7 Renesas, #8 SK Hynix, #9 ST, and #10 Micron). Of the seven top 25 semiconductor companies that registered a sales increase in 2012, four are headquartered in the U.S. and include Qualcomm, GlobalFoundries, Broadcom, and Nvidia.